It is becoming difficult these days to find a major developer that isn’t trying to pander to a wider audience. This is understandable since they want to expand their market and make more money. This attempt at widening the appeal of high budget games has probably been most evident in the Role-Playing genre, where games have been becoming increasingly accessible in order to accommodate those who do not wish to face a steep learning curve and challenging gameplay. The developer of the Witcher series, CDProjectRed, is one of the few teams who refuses to conform to this trend, and with their second release continue their trend of making games that actually require some intelligence, patience and effort on the part of the player. Most of the awkward and clunky components of the first game have been removed or revamped in the sequel, and the general appeal is consequently far greater, but this doesn’t mean that the game doesn’t require any effort from the player. Everything from the lore to the combat to the story require that you put in the time to learn, understand and follow everything that goes on in the game. You are thrown in to the deep end with this title, and if you aren’t at all familiar with the Witcher universe or the events of the first game you might flounder in the dialogue and story early on since so much jargon from the Witcher universe is used without explanation. Fortunately your journal contains a log of characters and events, so if you put in the time to read through it you can get caught up on most aspects of Geralt’s past without having to read the books, although playing the first game is certainly recommended if you want to get the most out of the story. Understanding the context for the game is especially important here since the story is so integral to the player’s enjoyment of this remarkable game. Some things you will learn of easily, such as Geralt’s amnesia and trade, but how he associates with other characters in the game, and the events of the first game, isn’t always well explained in the character log section of your journal. 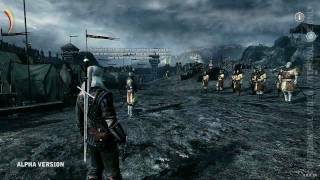 The Witcher 2 starts off with a bang, where Geralt relives a siege upon a castle and his witnessing of regicide. He is blamed for this assassination, but he himself knows who the real culprit is. This sets the stage for the story involving Geralt trying to clear his name and bring the real king slayer to justice. From here the plot twists and turns fantastically based on the decisions you make; your ability to influence the game’s overarching story is one of the most remarkable things about The Witcher 2. When you aren’t making important decisions about the story you are probably completing quests, most of which are quite entertaining and often branch out in interesting ways. You can still pick up contracts to kill monsters, but most quests involve solving mysteries or finding and dealing with different people in different scenarios. 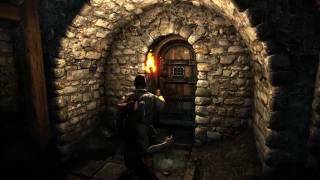 There aren’t a huge number of side quests in The Witcher 2, but those that are there are of very high quality and impressive variety. Unfortunately at this point there are a number of quest bugs that mostly involve scripting errors; sometimes events that are required to complete a quest aren’t triggered, and this can force the player to re-load an earlier save. If you stick to the main storyline you can expect to finish the game in 20-25 hours depending on the difficulty, but if you seek out and complete side quests the game can easily last well over 30 hours. The first two chapters are both lengthy and feel well fleshed out, but the third chapter feels a bit rushed and is overly brief, despite the story remaining strong throughout. 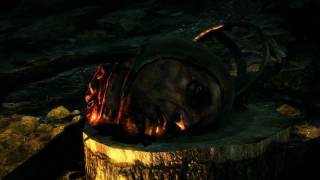 The combat in Witcher 2 has seen the most change from the first game, meaning that the timed clicking of the original has been replaced with more traditional action game style combat. You now directly control Geralt’s actions while fighting, which includes attacking with both light and strong attacks; parrying, dodging and casting any of the six spells which are all available from the start. The controls scheme is well laid out, but some actions suffer from a lack of responsiveness, especially drawing or switching between swords, and this can lead to Geralt taking damage as a direct result of the unresponsive controls. Thankfully the controls are responsive in the areas that count most; attacking, dodging and switching between spells is quick and easy. As with the first game, you can bolster Geralt before each fight by drinking potions and applying enhancements and upgrades to armour and weapons. The interface for alchemy and weapon and armour upgrading is much improved over the first game and is far less confusing. You can also opt to use a variety of other equipment during fights such as traps, bombs and throwing knives all of which are effective and useful in their own ways. Early on in the game you will need to use everything at your disposal to get through many of the fights, but later on many of these mechanics lose their usefulness as the difficulty lessens. The difficulty curve surrounding this combat is one of the biggest problems with the game, since at the beginning it is brutally difficult and gradually gets easier as you level up and upgrade your abilities. In the prologue you are thrown into the deep end with only a series of text boxes flashing on screen which act as a tutorial before you are thrown in to a number combat scenarios which are very challenging even on the normal difficulty setting. This means that the difficulty curve is quite backward; this game is most difficult during the prologue and chapter 1, and gradually becomes much easier as you progress through the second chapter. Many will be put off by the instantly difficult combat, but thankfully you have the option to lower the difficulty at any time via the options menu which helps quell the frustration of some early fights while you get used to the new combat system. Another addition to the game is the inclusion of quick time events which have replaced fist fighting entirely. Also during cut scenes and boss fights throughout the game you are required to mash a certain button at a certain time, but if this proves too difficult you have the option to turn off difficult QTEs. During fistfights you are now presented with a series of button prompts which flash up on screen; hitting the right buttons at the right time will have Geralt successfully attack an enemy. This system has its advantages since many of the manoeuvres completed by Geralt are fairly spectacular to watch, but the lack of depth found here is a bit disappointing, and you will only find use for fist fighting in a series of bar fight type quests. Another mini-game that has been added is arm wrestling where you have to hover your reticule over a moving bar, but this activity is unpleasant and bland. There are also a few stealth sequences interspersed throughout primarily the first chapter, and these are quite well done. If you remain undetected you can sneak up behind foes and knock them unconscious. If you are discovered you are forced to fight often large crowds of enemies. At this point in the game the combat is still quite difficult, so you have more than enough incentive to try and avoid your foes whenever possible. Yet if you are discovered, you can still progress without having to go through a trial and error process like some games will force you to. These different components combined with the exploration come together to make The Witcher 2 a more varied experience than its predecessor, something that helps to improve the pacing significantly. If it weren’t for the inconsistent difficulty I would easily say that The Witcher 2 has some of the best combat of any RPG out there. Character progression and levelling is handled differently than in the first game as well. As you level up you can choose to invest points in one of four skill trees: one for general stats, one for sword fighting, one for alchemy and one for signs. Each tree is massive and if you want to make Geralt powerful by the end you will want to specialize in one area. With sword fighting you can unlock and upgrade abilities such as parrying, dodging, and eventually an adrenaline bar which when filled allows for spectacular group finishers. Investing points into alchemy allows you to concoct stronger stat-boosting potions that last longer, while specializing in signs allows Geralt to upgrade his different magical abilities in ways that make them more powerful. This system is very well designed, and it is great fun to see how your version of Geralt improves over the course of a play through. One of the most important additions to the game in the area of character customization is the inclusion of the ability to upgrade Geralt’s armour and weapons on a regular basis. The first Witcher had you playing through the entire game with essentially the same two weapons and the same suit of armour. In the sequel you will have the opportunity to customize and upgrade your armour on several occasions. You also will be able to swap out and permanently upgrade your standard steel sword with more powerful variants you find throughout the game. You now have access to a variety of clubs, axes and swords that add a whole new layer of depth to the character customization. You will also be able to craft custom items by finding schematics and the raw parts which can be taken to a armourer for completion. It is a little disappointing that you still use your silver sword throughout the entire game with no opportunities for upgrades, but given the story this makes sense. The dialogue system in The Witcher 2 remains mostly unchanged from its predecessor, where you are given multiple options in what you want to say. There are a few instances where you have a limited amount of time to make a decision, and these moments are the most stressful parts of the game. The voice acting and writing has seen a notable improvement over the first game, and this makes it much easier to follow the story and associate with the characters. Translation from the original Polish language means that there are a few quirky lines and phrases, but these mostly serve to increase the game’s charm and character. The main characters in The Witcher 2 are some of the deepest and most complex I have ever encountered in a video game, and watching how they progress and interact with Geralt is one of the most impressive aspects of The Witcher 2. You will find yourself really caring about your favorite characters, and some of the decisions surrounding them are extremely difficult to make. Characters are rarely single dimensional; each person usually has their own motivations and reasoning behind their actions, many of which you will be able to influence the outcome of. The depth of choice pertaining to the story and characters is what makes this game such a fantastic RPG and what makes the world the game takes place in so lively and full of character. Issues surrounding racism, classism, drug abuse and sexism remain from the first game, and they are dealt with in an impressively mature tone, something that is largely absent from video games in general. One of the first announcements made about this sequel was that it would use a brand new engine made specifically for this game. This result is quite remarkable, since even with the settings turned down The Witcher 2 is one of the most visually impressive games around. The visuals aren’t impressive only from a technical standpoint, but the way in which the incredibly detailed environments combine with the amazing artistic vision of the game’s world make for an incredible abundance of ‘wow’ moments due to the visual fidelity. Facial animations are a bit stiff, and you will need a very powerful computer to see this game running in all its glory, but overall The Witcher 2 looks absolutely stunning. Load times and transitions between areas have seen huge improvements over the first game, although once you have a lot of save games it can take about half a minute from the time you press escape to the time you reach the pause menu. The audio quality has also seen a boost in quality from the first game, with monsters shrieks sounding terrifying and sound effects being crisp and detailed. The haunting atmospheric score of the original Witcher has been replaced by a more traditional fantasy orchestral soundtrack; it might not be quite as memorable as the music in the first game but it’s still good in its own right and works well with the content. If you are a fan of RPG’s and don’t mind a steep learning curve, Witcher 2 is a game that demands your attention. The plethora of game-changing choices, complex and highly political story combined with the fast-paced combat and immersive world of the Witcher 2 make this a stand out experience and worthy sequel to the first Witcher, despite a few unfortunate issues with the consistency of the difficulty and quest bugs. Breathtaking visuals combined with strong voice acting, good menu design and a decent score make The Witcher 2 a treat for the senses. The new combat system is great, but the backward difficulty curve makes this a difficult game to get into at the start. A lengthy and highly replayable single player component with a great story that changes dramatically based on your choices and actions. You will need a very powerful rig to see The Witcher 2 in all its glory. Lowering settings doesn't improve performance a whole lot, so older hardware can be a barrier. A deep and remarkable sequel with an abundance of choices and entertaining combat, marred by uneven difficulty and a few unfortunate bugs. Nice review, just finished the game. I agree the difficulty is a bit backwards, the better combat comes into its own during the second chapter too. Fantastic game and the depth of the story impressed toward the end. I am really excited to play this but I don't think my computer could really do it justice. Hopefully, it will make a nice transfer over to consoles sooner rather than later. If not, I'll get to it in a few years maybe. I agree with alot of this. Difficulty made me switch to easy just to end the frustrations of combat. Looks great, but runs not too well.